If we put Carson Wentz-mania aside for a minute and turn our attention to the 76ers one would notice that as training camp nears, the team has a number of nice pieces in place, but faces one looming question. The roster Sam Hinkie and the Colangelos have assembled features a deep and versatile frontcourt as well as athletic wings that can fill the lanes on the break, shoot the three ball and play defense. Add a respectable collection of guards to those items and one could argue that the Sixers now have an NBA worthy roster. With a solid, well liked head coach in Brett Brown at the helm, expert basketball predictions are saying the table is set for the 76ers to take a step forward this season. What the 76ers are going to do at point guard in 2016-17 is arguably the most intriguing question facing this franchise in the short term. They certainly are not lacking for options. However one option appears to be ideal for a team that will need consistent ball distribution and someone to run the offensive sets. The question now is, how quickly is the franchise willing to give this player that much responsibility? The choices for the starting point guard on the 2016-17 76ers range from young point guards with low ceilings to a combo guard with point guard experience to a steady international player to a possible point-forward phenom who this past weekend Hall of Famer Shaquille O’Neal described as a “Lebron-type player”. Last year, the diminutive Ish Smith was Philly’s offensive creator and fan favorite. However the Colangelos decided to let 28 year old Smith leave for Detroit (3 yrs. $18million) and if you watched closely as his level of play dipped at the end of last season you know that was a solid move. Last year Smith was backed up by T.J. McConnell and with Smith now in the Motor City, there is a long-shot possibility that the McConnell (who was in the first-five 17 times as a rookie) can earn the starting job in training camp. You can stop laughing now. I agree it’s unlikely that McConnell got taller or improved his quickness since we last saw him at the Las Vegas Summer League so let’s pencil him in as the backup point guard. To fill the void at starting point guard it seems more probable that the Sixers will turn to one of their two newcomers. Free agent acquisition Sergio Rodriguez is a veteran of many professional basketball leagues including the NBA (Portland, New York and Sacramento for five seasons between 2006-2010). He provided a steady presence (8 ppg. & 4.8 apg.) on-the-court for Spain’s national bronze medal winning team at the Rio Olympics as a capable shooter and passer. Sergio will certainly find his role in Brett Brown’s rotations, but it appears there is no chance that he would be considered for, let alone counted on as the starting lead guard. Another new acquisition, Jerryd Bayless (3 yrs; $27million), has a much better chance of being anointed the starting point guard. However, Bayless is not a pure point guard. He is more of a combo guard who has never averaged more than four assists in a season over his10-year NBA career. Bayless is also a journeyman veteran who has played for seven franchises (counting our Sixers). He has serviceable shooting range (a career high 43% from three last season) and a knack for scoring in limited minutes, but Bayless has never proven that he can be an every night starter in the Association. His 18 starts last season in Milwaukee were also a career high. The Sixers are in desperate need of a playmaker that each and every night can create shots for the wings around him (Henderson; Grant; Saric; etc. ), feed the young bigs the ball and provide leadership out on the floor. Out of respect for his resume and the contract the Clangelos just gave the veteran, Bayless could be the starting PG on opening night, but that trend shouldn’t last past the first month of the regular season. 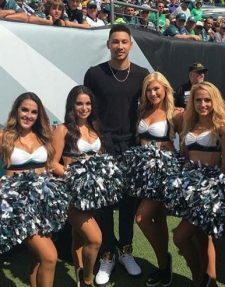 Obviously Simmons will need some time to learn how to play in the League and there will be growing pains. But even at just 20 years old, he owns the best court vision on the roster and is arguably the best passer too. Additionally, Simmons is basketball mature beyond his young age. Before his brief stint at LSU, Simmons played out of Australia’s renowned Australian Institute of Sport and internationally for the Boomers (Australian) national team. So he owns significantly more “professional” basketball experience than your typical rookie in the Association. Still, if Simmons does win the starting lead guard job at some point this season, flanking him with a player like Bayless may be a smart bet as it would surround Simmons with another ball handler and take some of the pressure off of the rookie. Whatever option Brown elects to go with one thing is for sure, there will be growing pains early on this season. Still, once the first month or so of the 2016-17 season is under their belts and the point guard dilemma has been settled, I expect to witness exciting and improved basketball from this 76ers squad.